Greek bakers in the northern city of Thessaloniki have made a giant "koulouri." It's a ring bread similar to a bagel, and was built around the city's most visible monument, the medieval White Tower. The bread, 540 feet in diameter, weighed 1.35 tons before baking. It is already gone, distributed to bystanders. A "koulouri" is a staple snack, sold mostly by street vendors. It can be found throughout the Balkans under different names. Elsa Koukoumeria, president of the Thessaloniki Bakers Association, said they would try to list the feat with the Guinness Book of Records. He said they would soon bake a much bigger one to encircle the burial mound of Amphipolis. That's northeast of Thessaloniki. Greek Bakers in the northern city of Thessaloniki are making giant bagels basically. The bread is 540 feet in diameter and weights 1.35 tons before the bake. This food is sold mostly by street vendors. The creater of this is trying to get put in the Guinness Book of Records. I think this would be good if they don't waste any of it. Otherwise I think it is a really weird idea. Also it might be cool to see a piece of bread that big. This is definitely not the weirdest thing yet. Also hoe did they get a big enough oven. In the Northern City of Thessaloniki, Greek bakers have been making a massive "koulouri.' Its a ringed bread that shows similarity to a bagel. Before they baked it, it was 540 feet in diameter, weighed 1.35 tons and was quickly gone. Distributed by bystanders. This bread is a simple snack, sold mostly by street vendors under different names. Elsa Koukoumeria, president of the Thessaloniki Bakers Association, said they are going to try to claim a world record in the guinness book of world records. They soon are going to bake a bread so large that it would be able to circle the burial mound of Amphipolis. Which is northeast of Thessaloniki. I wish that i could be their to try some of that bread. I love bread! I think that this is really cool because they are trying to claim a world record for World's Biggest Ring of Bread or something like that. All in All Greek bakers have baked a very large ring of bread, and i bet it was tasty! 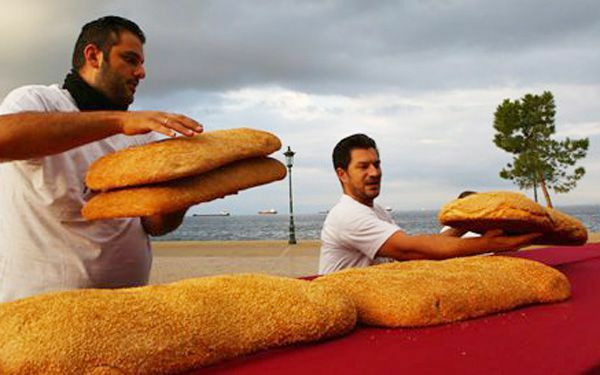 In Thessaloniki, Greece, bakers made a giant koulouri, which is a ring of bread similar to a bagel, around the White Tower. Bakers plan to make another one around the tomb of Amphipolis soon, which is much bigger. This article was very short, also had a short topic, so all of the information was provided. It also spoke of the bakers' future intentions. This was a very enjoyable story to read. This was a fun way to honor an important building. I also liked reading about how they handed the bread out to bystanders afterwards. I am sure the bakers were very pleases with the results and are very eager to start working on their next project. This article is about a giant koulouri made by Greek bakers. Koulouri is similar to a bagel and is sold mostly by street vendors. 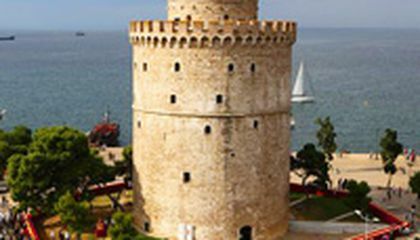 It was built around the medieval White Tower in Thessaloniki. The bread weighed 1.35 tons and was 540 feet in diameter. The president of the Thessaloniki Bakers Association, Elsa Koukoumeria said they would like to contact the Guinness Book of Records to try to list the feat. I think that this must of been a fun thing that happened in the city. It must have taken a really long time and a lot of people to make all the koulouri. Greek Bakers in the northern city of Thessaloniki are making giant bagels. The bread is 540 feet in diameter and weights 1.35 tons before the bake. This food is sold mostly by street vendors. The Creater of this is trying to get put in the Guinness Book of Records.Elsa Koukoumeria, president of the Thessaloniki Bakers Association, said they would try to list the feat with the Guinness Book of Records. He said they would soon bake a much bigger one to encircle the burial mound of Amphipolis. That's northeast of Thessaloniki. It looks weird, however is something unusual and interesting, possibly they can rich a position in the guinness book of records. A good idea could be distribute bread for people who need it in order to avoid wasting meal. It looks tasty and surely I would eat some piece of the greatest bread that I have ever seen. The article was about some Greek bakers that made a giant koulouri. This is a kind of bread similar to a bagel. The koulouri was made near the Medieval White Tower. The president of the Thessaloniki Bakers Association, said that they would try yo list their activity in the guinness book of records. I always find this kind of articles very interesting and funny. I would like to see activities like that in my city, since I consider it's a good option to have a good time with your family and friends, and alsochallenge ourselves.